Home/ Cosa bolle in pentola? I was born in a city near the Italian – Swiss border, part of my relatives leave there, as one of my uncles married a Swiss lady, and all my childhood was surrounded by Swiss chocolate, Swiss food, trip to get cheaper Swiss fuel and Swiss television. 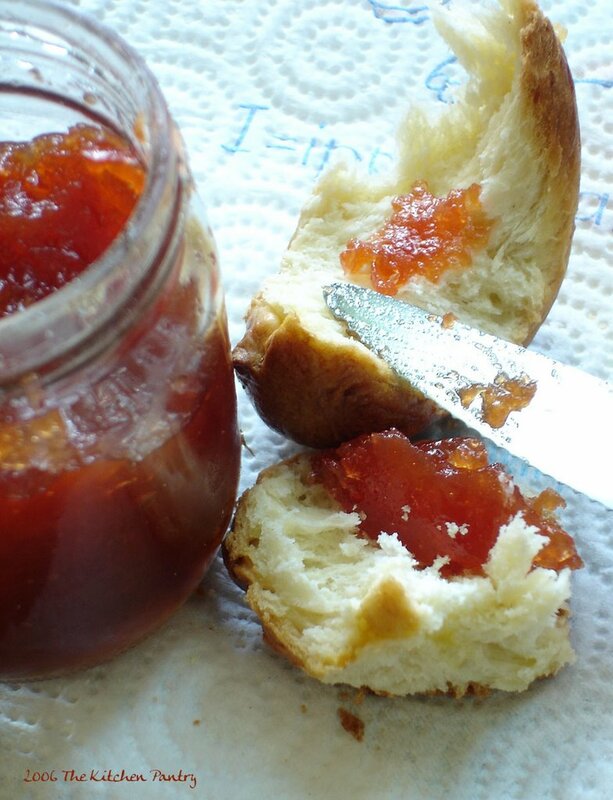 When in Italy food programs were still new and rare (and now there are too many, and not all good…), on Swiss television there was one of the program that made me the cook I am now: Cosa bolle in pentola? (what is brewing? ), presented by Bigio Biaggi, one of the pillars of the channel. Bigio was speaking mainly dialect (very similar to Lombardy dialects, so I could understand with no problem) and he could not cook at all, not even a boiled egg. He invited Swiss chefs and food amateurs and gourmets and made them cook some recipes, asking clever question along with very banal ones, but all the time useful. It was tuned for 8 years, stopped in 2000 or around that, and with the collection of my mother cook books, those were my first steps in the art of cooking. 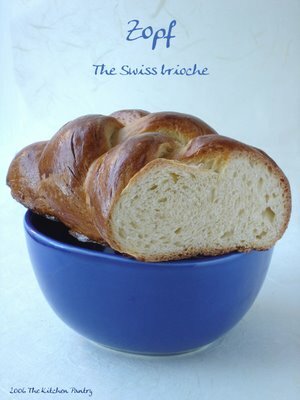 All this to tell you about this recipe for Swiss pigtail (braid): a wonderfull fluffy bread, slightly sweet. I strongly recommend an electric kneader (such us my wonderful Kenwood chef), because by hand you will need to knead for something like 30 minute to obtain the right texture. Adaptation from Pâtisserie maison, by Florence Edelmann. Melt the fresh yeast in the milk. Mix flour, sugar, vanilla sugar and salt in big bowl. Add the beaten egg and the melted butter, and begin to knead. Add the milk and yeast mixture and knead until you obtain a soft dough, not sticky, light and elastic (as said before, 30 minutes by hand, 15 minutes with Kenwood chef, beginning with the lowest speed for 5 minutes and continuing for 10 minutes at speed one). Make a ball and let it rest, cover with a tea towel, for 1 hour and half. Punch the dough, divide it in three, roll each piece in a thick 50 cm string and begin to make the pigtail (braid), exactly like the one you would do with your hair. Florence Edelmann explain another method, but frankly, I found it absolutely incomprehensible. Lay the pigtail (braid) on greaseproof paper over a baking sheet and let it rest, covered with a tea towel, for 1 hour. Glaze it with the beaten egg yolk and milk and cook in a preheated oven, 180° C, for 30 minutes. No translation (too lazy), get the book! bigio!!!! il mio eroe…per anni ho registrato le sue trasmissioni (ognuno ha i suoi segreti…)! il mio più grosso dlore è che ora la tsi è invedibile. maledizione al digitale teerrestre, uf! Grande lutto anche a casa dei miei genitori: mia madre si vedeva tanti bei film sulla TSI! Your brioche looks delicous, it’s not something I’ve tried making yet, but my new kitchenaid mixer (his name is wilbur) will change all of that!